웹후크를 지원하는 사용자 지정 API를 만드는 방법에 대해 자세히 알아봅니다.Learn more about how to create custom APIs that support a webhook. 트리거는 논리 앱에서 워크플로를 시작하는 이벤트입니다.A trigger is an event that starts a logic app workflow. 웹 후크 트리거는 이벤트를 기반으로 하는 새 항목에 대 한 폴링에 종속 되지 않습니다.The webhook trigger is event-based, which doesn't depend on polling for new items. 웹 후크 트리거를 통해 논리 앱을 저장 하는 경우 또는 사용 안 함 상태에서 논리 앱을 변경 하면 웹 후크 트리거 구독 지정한 서비스에 등록 하 여 끝점을 콜백URL 해당 서비스 또는 끝점을 사용 하 여 합니다.When you save your logic app with a webhook trigger, or when you change your logic app from disabled to enabled, the webhook trigger subscribes to the specified service or endpoint by registering a callback URL with that service or endpoint. 트리거는 다음 필요에 따라 논리 앱을 실행 하는 URL을 사용 합니다.The trigger then uses that URL to run the logic app as necessary. 같은 합니다 요청 트리거, 예상한 이벤트가 발생 하면 즉시 논리 앱에서 발생 합니다.Like the request trigger, the logic app fires immediately when the expected event happens. 트리거가 구독 취소 에서 논리 앱을 설정 하는 사용 하지 않도록 설정 하도록이 변경한 경우 또는 트리거를 제거 하 고 논리 앱을 저장 합니다.The trigger unsubscribes if you remove the trigger and save your logic app, or when you change your logic app from enabled to disabled. 논리 앱 디자이너에서 HTTP 트리거를 설정하는 방법을 보여 주는 예제는 다음과 같습니다.Here's an example that shows how to set up an HTTP trigger in the Logic App Designer. 이러한 단계에서는 Logic Apps에서 사용되는 웹후크 구독 및 구독 취소 패턴을 따라 API를 이미 배포했거나 액세스하고 있다고 가정합니다.The steps assume that you have already deployed or are accessing an API that follows the webhook subscribe and unsubscribe pattern in logic apps. HTTP 웹후크 트리거를 논리 앱의 첫 번째 단계로 추가합니다.Add the HTTP Webhook trigger as the first step in a logic app. 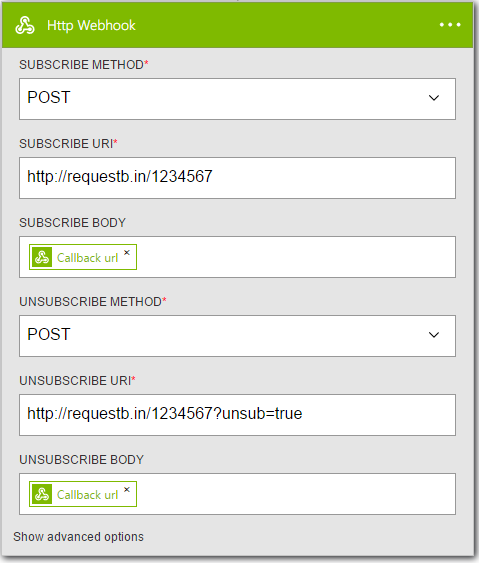 웹후크 구독 및 구독 취소 호출에 대한 매개 변수를 입력합니다.Fill in the parameters for the webhook subscribe and unsubscribe calls. 이 단계는 HTTP 동작 형식과 동일한 패턴을 따릅니다.This step follows the same pattern as the HTTP action format. 하나 이상의 동작을 추가합니다.Add at least one action. 저장을 클릭하여 논리 앱을 게시합니다.Click Save to publish the logic app. 이 단계를 수행하면 이 Logic App을 트리거하는 데 필요한 콜백 URL을 사용하여 구독 엔드포인트가 호출됩니다.This step calls the subscribe endpoint with the callback URL needed to trigger this logic app. 서비스에서 콜백 URL에 댛 HTTP POST 를 수행할 때마다 논리 앱이 실행됩니다(논리 앱에는 요청에 전달된 모든 데이터가 포함됨).Whenever the service makes an HTTP POST to the callback URL, the logic app fires, and includes any data passed into the request. 예를 들어 합니다 승인 전자 메일 보내기 작업은이 패턴을 따르는 웹 후크 동작의 예입니다.For example, the Send approval email action is an example of webhook action that follows this pattern. 이 패턴을 웹후크 동작을 통해 서비스로 확장할 수 있습니다.You can extend this pattern into any service through the webhook action. 논리 앱 디자이너에서 웹후크 동작을 설정하는 방법을 보여 주는 예제는 다음과 같습니다.Here's an example that shows how to set up a webhook action in the Logic App Designer. 이러한 단계에서는 Logic Apps에서 사용되는 웹후크 구독 및 구독 취소 패턴을 따라 API를 이미 배포했거나 액세스하고 있다고 가정합니다.These steps assume that you have already deployed or are accessing an API that follows the webhook subscribe and unsubscribe pattern used in logic apps. 다음 단계 > 동작 추가를 선택합니다.Choose New Step > Add an action. 검색 상자에 "웹후크"를 입력하여 HTTP 웹후크 동작을 찾습니다.In the search box, type "webhook" to find the HTTP Webhook action. 런타임 시 논리 앱은 해당 단계에 도달한 후 구독 엔드포인트를 호출합니다.At runtime, the logic app calls the subscribe endpoint after reaching that step. 저장을 클릭하여 논리 앱을 게시합니다.Click Save to publish the logic app. 웹후크가 지원하는 트리거 및 동작에 대한 자세한 내용은 다음과 같습니다.Here are more details about the triggers and actions that webhook supports. HTTP 웹후크HTTP Webhook 필요에 따라 URL을 호출할 수 있는 서비스에 대한 콜백 URL을 구독하여 논리 앱을 실행합니다.Subscribe a callback URL to a service that can call the URL to fire logic app as needed. 필요에 따라 URL을 호출할 수 있는 서비스에 대한 콜백 URL을 구독하여 논리 앱을 실행합니다.Subscribe a callback URL to a service that can call the URL to fire logic app as needed. *는 필수 필드를 의미합니다.An * means required field. HTTP 웹후크HTTP Webhook 필요에 따라 URL을 호출할 수 있는 서비스에 대한 콜백 URL을 구독하여 워크플로 단계를 다시 시작합니다.Subscribe a callback URL to a service that can call the URL to resume a workflow step as needed. 필요에 따라 URL을 호출할 수 있는 서비스에 대한 콜백 URL을 구독하여 워크플로 단계를 다시 시작합니다.Subscribe a callback URL to a service that can call the URL to resume a workflow step as needed. *는 필수 필드를 의미합니다.An * means required field.